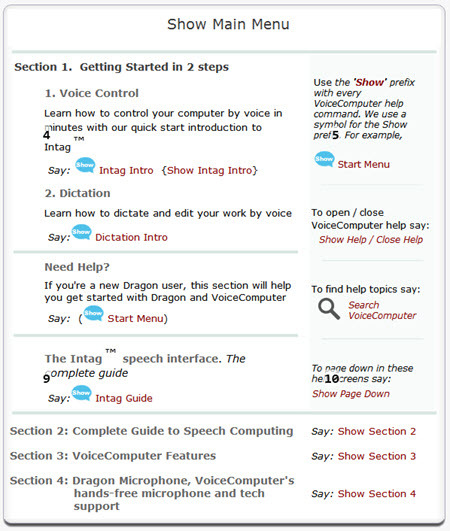 VoiceComputer has the most comprehensive Dragon help and training available. And our help is interactive and easy-to-use. We actually make it easy to get the help and training you need as you are in the middle of performing the activity you need help with - with no interruptions! VoiceComputer brings a game-changing speech user interface to Dragon - a simple way to control your computer - that makes Dragon easy-to-use. 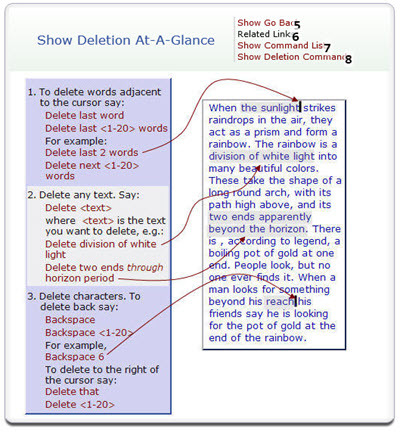 Our speech user interface is apparent the moment you open the program. The user interface lets you control every program you use, with the same basic set of five voice commands. If you find that controlling your computer with VoiceComputer is extraordinarily simple, it’s probably because controlling your computer with Dragon is extraordinarily complicated. With Dragon, without VoiceComputer, you need to use hundreds of commands to control your computer by voice. Even an experienced user must take frequent peaks at the Dragon’s help to remember what commands to use. Most Dragon users give up because it's just not worth the hassle. VoiceComputer’s patented speech interface combines Dragon lessons, Dragon videos, tutorials, and on-screen display to bring an interactive Virtual Trainer to the desktop. This is not a workbook or a training video and, it is more than a tutorial program: it is a coach, a Virtual Trainer, available anytime with a quick voice command to teach you how to use and master Dragon, while you’re working, right alongside your applications, without losing your place. The easiest-to-use, fastest and most accessible Dragon help system available. A single speech command anywhere, anytime, gives you the Dragon help you want, right alongside your applications, with no interruption of your work! Now you can ask for and get help in real time without losing your place or covering up your work.